Stems: Erect, 1-4, stout, unbranched, pubescent, arising from large rootstocks. Leaves: Basal leaves stalked, spatulate, frequently absent or withered; stem leaves opposite, simple, sessile or clasping, thick, lanceolate to ovate, 1.5 to 6 inches long, 1/2 to 2 inches wide, glabrous or minutely hairy; margins weakly to sharply toothed. Inflorescences: Panicles, elongate, 4 to 20 inches long, with 3-8 distinct whorl-like clusters of 2-6 flowers. Flowers: Calyces 5-lobed, glandular-pubescent, sticky; corollas showy, 1.5 to 2 inches long, pale-purple, white or pinkish, strongly 2-lipped, upper lip 2-lobed, lower lip 3-lobed, lobes rounded, glabrous inside, finely pubescent outside; throat with prominent magenta or violet lines; stamens 5; 4 fertile; 1 sterile, flat-tipped, curving backward, bearded with golden-yellow hairs. Fruits: Capsules, egg-shaped, 1/2 to 3/4 inch long, woody; seeds small, numerous, black. Habitat: Dry, rocky open prairies, eroded pastures, and hillsides, on limestone, sandy loam, or gypsum soils. 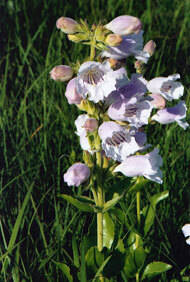 Forage Value: Livestock, particularly sheep, readily consume new growth of cobaea penstemon. Comments: The plant may be 2-3 years old before producing blossoms.